Pure 24 karat gold is a soft, malleable metal. In jewelry manufacturing, it is usually alloyed with other elements such as silver and copper to increase its hardness and to improve its wear resistance. 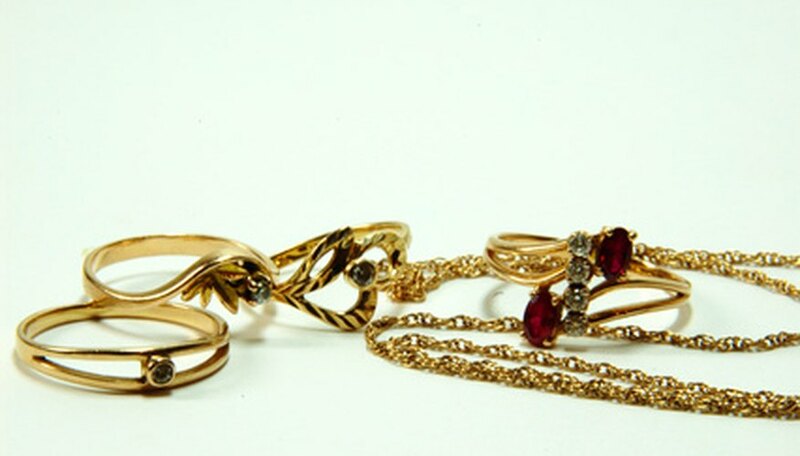 Gold jewelry is stamped with a karat rating to define the amount of pure gold contained within its alloy. Although copper and brass resemble gold when polished, these metals are almost worthless in small amounts. A gold test kit will tell you if a piece of metal is gold or copper. Score a half-inch line on the flat black test stone provided in the gold test kit by rubbing the edge of the metal up and down against its surface two or three times. This will leave a thin line of metal particles embedded in the stone. Place a small droplet of acid from the squeeze bottle bottle marked "14 karat" on one end of the line. If the line fizzes, turns green and disappears, the piece of jewelry is made of copper or brass. If the line fades but does not disappear altogether, the piece is made out of gold with a lower rating than 14 karat. If the line discolors slightly, but remains, the piece is made out of 14 karat gold. If the line stays bright without discoloring the jewelry has a higher rating than 14 karat. Squeeze a droplet of 18 karat test acid onto the middle of the yellow line. If the line fades slightly, the piece being tested is 18 karat. If it remains bright, the jewelry is made out of 22 karat gold. You can prove this by placing a droplet of 22 karat test acid on the remaining part of the line. Wear latex gloves when doing a gold acid test.